English, Henry VIII, AD 1509 to 1547. Silver groat. Denomination : Silver Groat. Mint : London, initial mark rose. 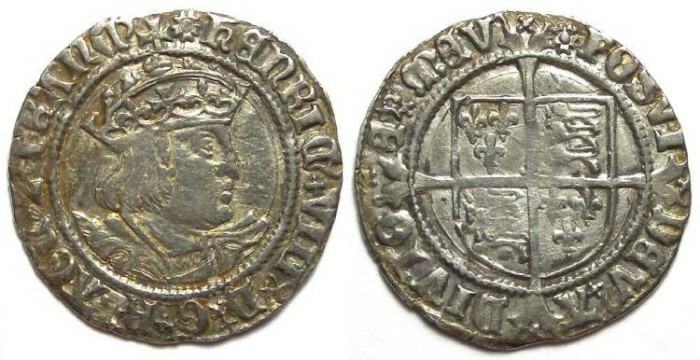 Date : 2nd coinage of 1527 to 1544. Size : 23.6 x 24.3 mm. Weight : 2.72 grams. Grade : gVF although at some time it was cleaned and has now retoned. Obverse : Head of Henry VIII right, with HENRIC VIII D G REX ANGL Z FRANC around. Reverse : Long cross on a shield, with POSVI DEV ADIVTOE MEV (Latin for I HAVE MADE GOD MY HELPER).